September 4th in Wordpress Plugins, Wordpress Tips by Wordpress Jedi . Many bloggers and journalists post YouTube videos in their posts to provide more value to their readers. You don’t want YouTube and Vimeo videos to slow down your website though. 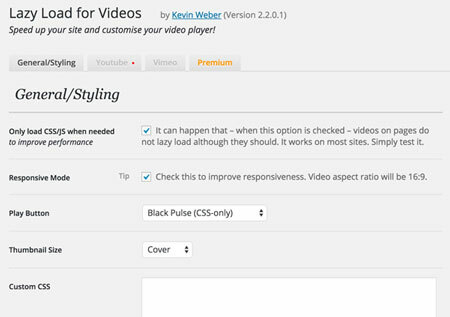 Lazy Load for Videos is one of many plugins you can take advantage of to lazy load videos on your website. It replaces each embedded video with a clickable preview image but does not take away from your visitors’ experience. Lazy Load for Videos is easy to customize. It lets you hide controls of the YouTube player. You can also hide annotations and add custom CSS from the options panel. Want to add your ads to your list of videos? No problem. Lazy Load for Videos also lets you hide related videos, change the color of the player, and disable the Responsive Mode. Lazy Load for Videos makes your website feel faster by replacing videos with images and loading videos when they are clicked on. You can try the plugin for free.